The costume designer Ernie Kniepert attended a school of arts in Vienna and afterwards took lessons by Otto Friedrich for fashion and costume drawing. 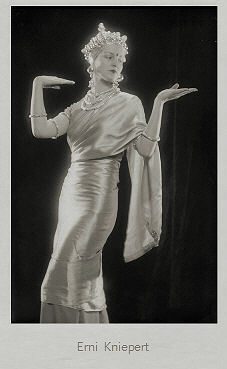 When she finished her education she was able to gain a foothold as a costume designer at the Staatsoper in 1934. Beside it she also created costumes for the dancer Gertrud Krauss. In the next years she worked for different theaters and operas and she was especially successful with her folklike costumes. Finally she even got an engagement in the USA where she created costumes for the next two years - this time also for movies. Her name was not named in the credit list. When she returned to Europe she continued to work as a costume designer for the film and she took part in "Dreimal Hochzeit" (41) and "Brüderlein fein" (42). Beside it the stage remained her main sphere of activity, so for the legendary Burgtheater among others. After World War II she went on with her career at the theater and for the film and later television. To her cinematical works belong "Triumph der Liebe" (47), "Der Bauer als Millionär" (61), "The Magnificent Rebel (62), "Pension Schöller" (78) and "Der Rosenkavalier" (84).